Departing from Edinburgh 08:30am and returning to Edinburgh no later than 18:30pm. Travelling via northwest on the way you will be able to see Stirling Castle, before making our way through the Trossachs and Rob Roy Country of Campbell and MacGregor Clans then driving over the barren landscape of Rannoch Moor and the Black Mount to Glencoe, one of Scotland’s most famous glens and the site of the 1692 massacre of the Clan MacDonald. Continuing via the Fort William area and travelling through the pretty village of Fort Augustus we arrive at Loch Ness. Please Note: For lunch please confirm on the day with your driver what type of food you prefer such as light snack or full lunch and he will recommend where to eat. Lunch is not included in the price of tour. 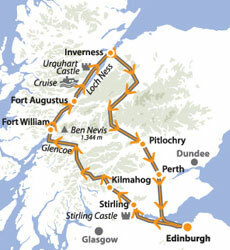 Return trip will be via Pitlochry, Perth and across the Forth road bridge to Edinburgh see map route below.